In Italy there is a saying that goes "Non fate la guerra ma pane e pomodoro, ovunque e sempre" (“Make bread and tomato, anytime and anywhere, not war”). Tomato, together with potato, is currently the most cultivated horticultural product in the world. Tomatoes were originally found and cultivated in South America in early 1500s. However, farmers of the Mediterranean area discovered the possibilities of their use in the middle of the 18th century. Tomatoes have always been protagonists in all kinds of recipes, thanks to their great versatility. Rusichella d’Abruzzo chooses for you the best tomatoes in order to guarantee top quality. 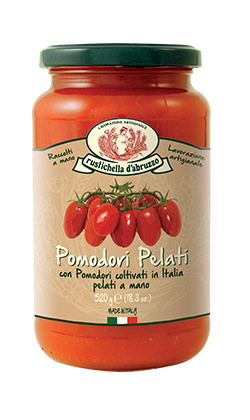 Rustichella d’Abruzzo Peeled Tomatoes carry all of the genuineness and perfume of freshly picked tomatoes. They are perfect for delicate soups or perfumed first courses and match Rustichella d’Abruzzo regional types of pasta. 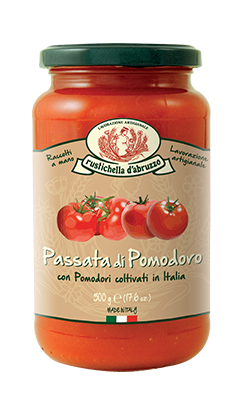 Rustichella d’Abruzzo Tomato Puree reminds us of families that traditionally prepare the preserves for the winter during summertime afternoons. 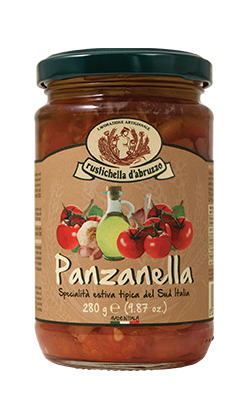 It is perfect for dense and rich “Sunday sauces” or simply heated and ready to be sautéed in combination with one of Rustichella d’Abruzzo short types of pasta. Rustichella d’Abruzzo Cherry Tomatoes are “vertically” cultivated. The fruit is small, between 15 and 25 g, tasty and intensely red-coloured. We recommend using them “raw” by pan-frying them together with one of TRITICUM 100% organic farro short types of pasta. 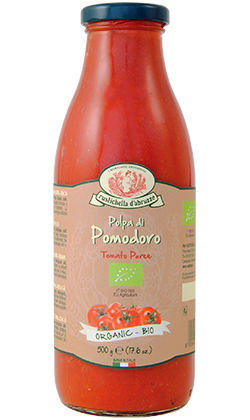 Rustichella d'Abruzzo selects the best organic Tomato Pulp in order to offer you an incomparable perfume for your dishes. Made through certified 100% organic farming, tomato pulp is perfect for your summer recipes that require short cooking time and for the seafood-based ones. 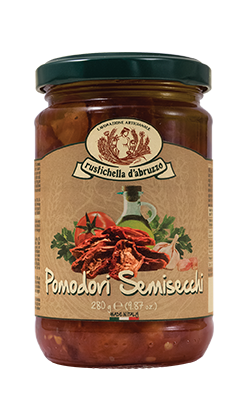 Rustichella d’Abruzzo Semi-dried Tomatoes are dried and preserved in Extra virgin olive oil with addition of garlic, oregano, parsley and salt. They are perfect for a hot bruschetta with a bit of Rustichella PrimoGrano INTOSSO monocultivar Extra virgin olive oil, or tasted on whole wheat bread or on a fresh focaccia. They also match meats or steamed seafood with a bit of oregano and Rustichella Extra virgin olive oil. When summer comes, Rustichella d’Abruzzo Panzanella becomes the protagonist of the most beautiful moments to spend with other people. It is perfect with a fresh focaccia or for a salad with our TRITICUM 100% organic Pizzichi di Farro, and also with a bruschetta and a bit of PrimoGrano INTOSSO monocultivar Extra virgin olive oil. Available in August and September only.